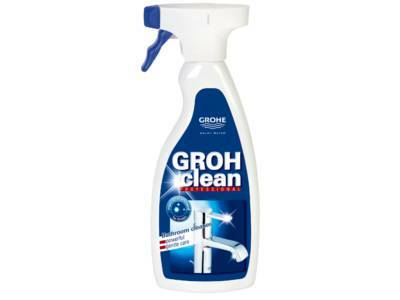 GROHclean is our environment-friendly cleaning liquid. Scale and water strains, dirt, grease and hardened spots of soap; for bathrooms, toilets and kitchens, as well as fittings, accessories, baths, ceramics, shower partitions and tiles. Spray on the relevant surface, allow briefly to take effect. based on citric acid, Tensides 90% biodegradable according to OECD test method.